When you first starting up you will see the Windows 7 desktop or a Welcome screen once you loaded into the desktop environment. Normally the desktop contains start button, taskbar, windows, icons, gadgets, files, and programs. You can use the desktop to access, store, organize, modify, share, and explore information, whether it resides on your computer, a network, a HomeGroup or the Internet. The following shows the main screen of the Windows desktop environments. Provides a launch point for all commands and applications on your system. Can use to quickly start a program, find and open files, access the Windows Help and Support Center, shut down computer, etc. Positioned at the bottom of the screen. It contains Start button, Program or Taskbar Buttons, icons for each running application, the Notification Icons and show desktop button. 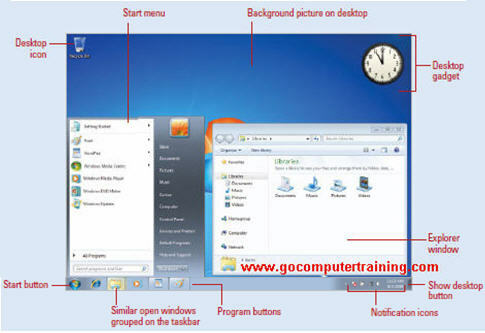 For more information about the Windows 7 taskbar, visit this tutorial. Provides quick access to specific program. By default, Windows 7 show the Recycle Bin icon. However, you can add or remove frequently used program icons to the desktop. Allow you to quickly access various handy features from your computer desktop such as Internet radio, slide show, traffic maps, feed online data direct to your desktop, and more. By default, you don't see any gadget appears on the desktop. You can add, change, move or close the gadgets from the desktop as describes here. Choose Start, point to All Programs and locate the program on the list of programs that you wish to make a shortcut to the desktop. 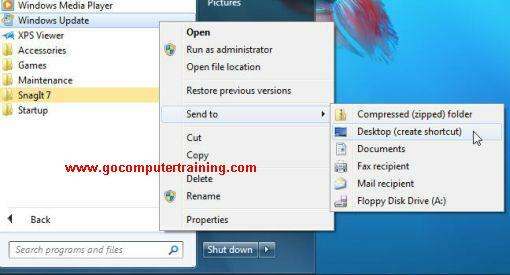 Right-click on that program, and point to Send To and click on Desktop (create shortcut). The shortcut appears on the desktop. Double-click the icon to open the application. Right-click the desktop and choose View from the shortcut menu; be sure that Auto Arrange option isn't selected. To arrange desktop icons manually, just click any icon and drag it to another location. Alternatively, you can right-click the Windows 7 desktop and from the shortcut menu, choose Sort By and then click the criteria for sorting your desktop shortcuts. Note: To arrange icons on the Windows 7 desktop, you need to place few icons on the desktop only you will see the effects.